Please join Canyon Cinema on the evening of Monday October 5, 2015 at New Nothing Cinema for the fall 2015 season opener of our Salon series. This month, we’re pleased to welcome filmmaker Amy Halpern who will present a selection of recent 16mm films from her Assorted Morsels (2012) series – Three-Minute Hells (with Arwa Ibrahim), By Halves and Elixir (with Asha Wilson & Joyce Campbell) – along side All My Life by Bruce Baillie, Fever Dream by Chick Strand, Fog Line by Larry Gottheim and more. 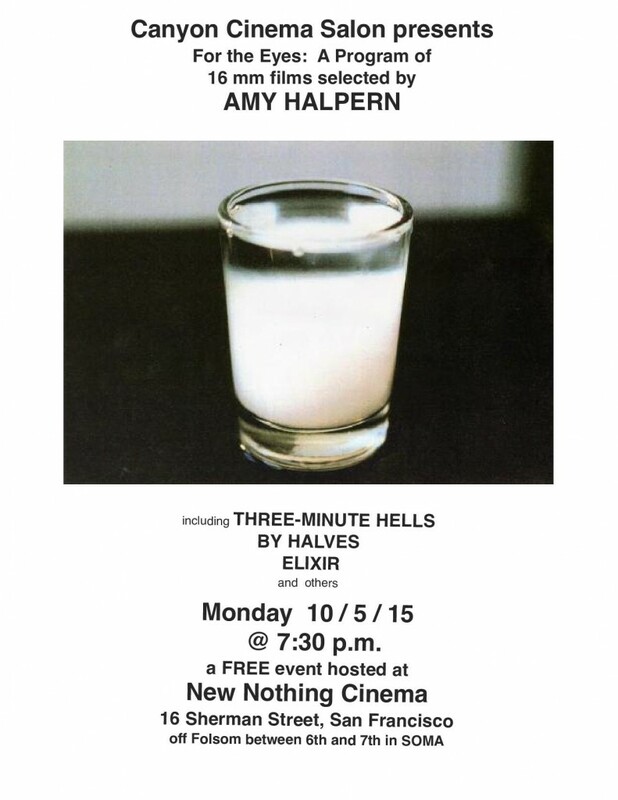 Amy Halpern is a New York filmmaker, living & working in Los Angeles. Since childhood, composing with movement and light, and making 16mm abstract films since 1972. Work in the film business in camera & lighting (I.A.T.S.E. 728). Taught film for many years, most recently 7 years at U.S.C, also at California State University L.A., Cal. State Northridge, Otis-Parsons Art Institute and a second grade class in L.A. Unified School District. She has collaborations (lights, camera, person) with Charles Burnett’s MY BROTHER’S WEDDING, Pat O’Neill’s THE DECAY OF FICTION, Julie Dash’s ILLUSIONS and David Lebrun’s BREAKING THE MAYA CODE and DANCE OF THE MAIZE GOD. She also appears in several of Chick Strand’s films, SOFT FICTION, KRYSTALNACHT, CARTOON LE MOOSE & FEVER DREAM. Born and raised in New York City, Halpern studied & performed in modern dance with Anna Sokolow & Lynda Gudde, worked in the early 1970s in 3-D shadow-play with Ken Jacobs’ New York Apparition Theatre and co-founded New York’s Collective For Living Cinema with 3 other guys.